Mars remains an evening object. It is low in the southwest at dusk. Jupiter is now up all night long. Opposition — when Earth is directly between Jupiter and the Sun and Jupiter literally rises at sundown and sets at sunup — is Dec. 3. After that date, Jupiter only gets higher and more prominent in the evening sky. Face east/northeast at dusk and look for the brightest thing there (unless the Moon is also there), as Jupiter outshines all stars we see at night. Venus remains in the east at dawn, continuing a spectacular morning apparition. It now appears a little closer to the horizon each morning. Saturn is a little higher in the morning sky this month; look for it just above the much brighter Venus. Mercury is visible for the first half of the month at dawn. Look just under Venus. The autumn ‘intermission’ — when few bright stars are out at dusk — is over; brilliant winter stars enter the evening skies of December. Watch dazzling Orion rise as twilight ends. He rises with his three-starred belt almost vertical, halfway between reddish Betelgeuse and bluish Rigel. Orion’s belt points up to Aldebaran in Taurus, the Bull. This winter, the Bull also contains Jupiter. Rising with Orion and far to his left are the twin stars Castor and Pollux, marking the heads of Gemini, the Twins. By 8 p.m. in mid-month, the two Dog Stars have joined Orion. You can find Sirius, the brightest star we ever see at night, by drawing a line from Orion’s belt towards the horizon. Last Quarter December 6, 9:32 a.m.
New December 13, 2:41 a.m.
1st Quarter December 19, 11:19 p.m.
Full December 28, 4:22 a.m.
At 5:12 p.m. on Friday, Dec. 21, the Sun is directly overhead at the Tropic of Capricorn, the farthest point south at which it can be overhead. This puts the Sun as low as possible in our daytime sky, and as high as possible in the sky for anyone in the Southern Hemisphere. This also makes daytime as short as possible for us, and as long as possible for folks “down under.” Accordingly, this moment is the winter solstice in the Northern Hemisphere and the summer solstice in the Southern Hemisphere. The Geminid Meteor Shower peaks this month, as it does every December. Along with the Perseids in August, the Geminids are one of the two most reliable meteor showers, producing on average about 100 meteors per hour. 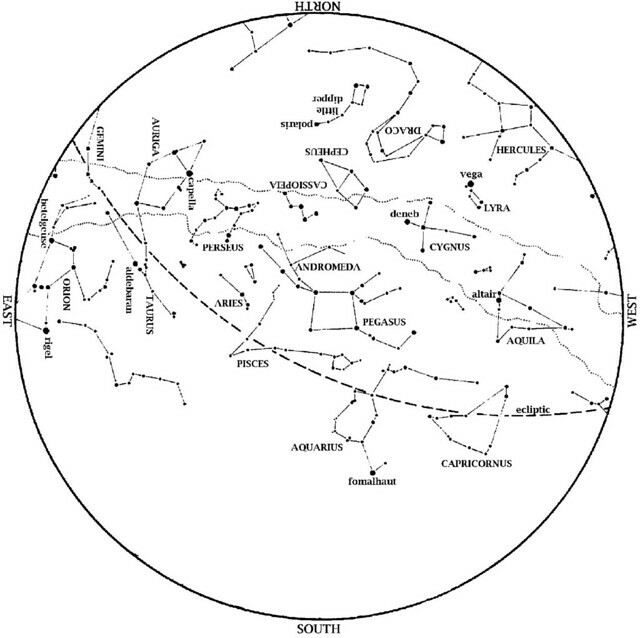 The Geminids are unique among meteor showers because they are associated not with a comet but with an asteroid, 3200 Phaethon. This means that with Geminids, we see significant activity much earlier in the night than with other showers. Most meteor showers peak in the hours immediately before dawn. This is because what plows through the debris field is the leading edge of the Earth, and that’s the side going from night into day. Since Phaethon is an asteroid, however, debris along its orbital path forms a shallower angle to Earth’s orbital path, meaning that we begin to face into the debris field as early as 9 or 10 p.m. Meteors will seem to ‘radiate’ from the constellation Gemini, hence the name of the shower. However, they may appear anywhere in the sky. As always, you see more meteors the farther you are from big city lights, which hide dimmer ones. Our George Observatory will be open Friday night, Dec. 14, into Saturday morning, Dec. 15, for observing this meteor shower. Previous Post O Tannenbaum! The HMNS halls are officially decked — see it in pictures!